THE CREATIVE DANCE TEAM IS PLANNING ON TAKING A FIELD TRIP TO NEW YORK THE AVLIN ALIEY DANCE CENTER IN APRIL 2014, WE NEED YOU HELP AND SUPPORT IN RAISING FUNDS, RENTAL OF THE BUS IS $4200.00 PLEASE HELP US GET THERE. Committed to bringing dance into the classrooms, communities and lives of people throughout the world, Ailey Arts In Education & Community Programs include special performances, lecture-demonstrations, technique classes and curriculum-based residencies. AileyDance Kids In fulfillment of Alvin Ailey�s long-standing dictum �dance is for everybody�, the AileyDance Kids residencies give young people all over the tri-state area the opportunity to explore their creative potential while also imparting life-skills like teamwork and self-discipline. AileyDance Kids serves grades PreK-12, and has a variety of programs to meet the Arts In Education needs of any school. AileyCamp AileyCamp is an innovative summer program designed to serve inner-city children grades six through eight. National Outreach Experience a master class, lecture, lecture-demonstration or dance workshop with an Alvin Ailey American Dance Theater company member, or have your students (grades 6-8) explore the themes of Revelations with our "Revelations: An Interdisciplinary Approach" curriculum. Visit our home in the heart of NYC and experience Ailey in a whole new way. The Ailey Studios at The Joan Weill Center for Dance is the ultimate destination for dancers of all ages and levels. Home to the world-renowned Alvin Ailey American Dance Theater and the largest building dedicated to dance in New York City, the Ailey Studios offer numerous options for unique group experiences, including private and open classes in a variety of techniques from around the world, class observations, building tours, discounted tickets to Ailey performances, and much more. Our Group Coordinator will work with you to design a package tailored specifically to your needs. Whether you are looking for a corporate team building activity or a quintessential New York experience with your friends, the Ailey Studios has something just for you. We look forward to welcoming you into our home. Rates and packages are provided as examples. Your group coordinator will work with you to plan a personalized event for your group's interests and budget. Open Class Group Rates include assistance with scheduling. Subject to an administrative fee of 5%. Group leader must pay for all classes in advance, two weeks prior to arrival. Participants may not pay for classes individually. Accompanist fees apply for classes requiring accompaniment, ie. ballet. Subject to an administrative fee of 5%. Discounts available for groups of 20 or more. Suggested for groups of 10 or more. Reasonable rates available upon request. Subject to an administrative fee of 5%. There are no refunds after final payment, due two weeks prior to arrival. Cancellation of any group visit package will incur a cancellation fee. Fill out the Group Request Form below. Our group coordinator will contact you to work out details. Please allow at least 4 weeks prior to your planned visit. Send 50% deposit to reserve your group's visit. Make Final Payment. Final payment is due two weeks prior to your scheduled arrival. At that time, the group coordinator will contact you to finalize any additional options and details. The Ailey Studios, the largest building dedicated to dance in New York City, the dance capital of the world, officially opened in March 2005. "Our breathtaking new building, designed by Iu + Bibliowicz Architects, is a glorious home for the Company, Ailey II, The Ailey School and all of our diverse educational programs," stated Artistic Director Emerita Judith Jamison. "I am so grateful to everyone who helped realize this long-time dream, particularly Joan and Sandy Weill for their extraordinary commitment to Ailey." "We have arrived at this moment in Ailey's history thanks to the artistry and vision of Judith Jamison and this dance center is a testament to her exceptional leadership," acknowledged Joan Weill. "We are deeply grateful to Mayor Bloomberg and to the City Council for their outstanding support and for recognizing the importance of the Ailey organization to the cultural fabric of New York City." Fittingly, the eight floor, 77,000 square foot facility is on the site of the former WNET TV studios, where the Company's first television appearance occurred over four decades ago. 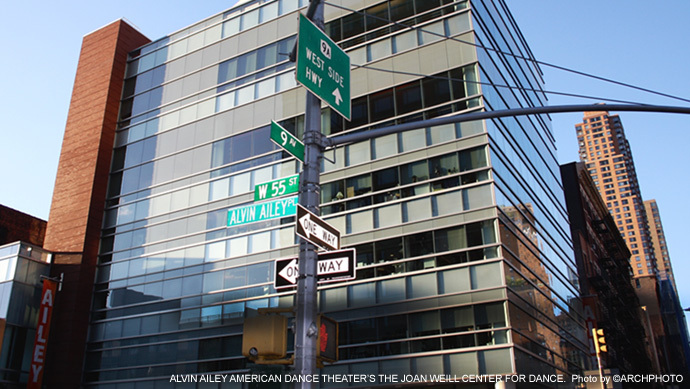 Located in Manhattan's Special Clinton District at 9th Avenue and 55th Street, The Joan Weill Center for Dance includes 12 dance studios, a 5,000 square foot performance space with flexible seating for 255, library, costume shop, physical therapy facilities, lounges and administrative offices. High-spirited, folkloric dances expressing narratives from across the African continent. Fast-paced and rhythmic, these total-body workouts also provide a powerful cultural experience. Live traditional drumming accompanies every class, from beginner to experienced. Dance techniques include West African and Sabar. Journey through African and Caribbean folkloric dance traditions, and expand your understanding of their integral role in the development of American dance. Classes are available for beginners as well as more experienced students and include Haitian Folkloric, Dunham, and Afro-Cuban techniques. The dance standard for grace and precision of movement, ballet sculpts the entire body while promoting flexibility, proper alignment, and strength. Whether ultimate novice or experienced dancer, the Ailey Extension has a ballet class suited to your abilities. Experience the beauty of this rhythmic Afro-Brazilian art form that blends martial arts, dance, and acrobatic movements. Capoeira has been known to increase agility, balance and coordination, flexibility, muscle strength, posture, and overall cardiovascular health. Live musicians contribute to the cultural workout experience. Classes are available for novice as well as more experienced students. A multi-level, non-competitive class designed to improve harmony of movement through an expressive flowing series of combinations integrating Graham-based Modern, Horton, Yoga, and Ballet. Choreography builds throughout each week to fine-tune the body and develop artistic and technical performance. Students should have some prior experience with Horton and/or Ballet. These animated classes fuse Latin, Indian, Middle Eastern, and other international dance styles in an approachable, dynamic, and entertaining medley of choreography that tones muscles and blasts calories. Variety of classes include The Masala Bhangra Workout�, SharQui� Bellydance Workout, and Zumba� Fitness. All levels are welcome. Immerse yourself in the culture of hip-hop as you learn to pop, lock, break, with classic moves like Da Mona Lisa and new choreography from the nation's best hip-hop dance crews, past and present. Vivacious and energetic, classes are available for novices through experienced and provide a great mix of cardio and stretching. Created by Alvin Ailey�s mentor, Lester Horton, this is a major codified modern dance technique reputed to fortify, stretch, and strengthen the human body. Horton aims to correct physical faults and prepare you for any type of dancing you may wish to follow. Classes are available for beginners as well as more experienced students. Channel your inner Broadway dancer in these challenging and engaging classes that emphasize syncopation as well as expression, body alignment, and strength. Classes are available for beginners as well as more experienced students and include Jazz Basics, Broadway Jazz, and Theatre Dance. Experience the beauty of Raks Sharki, Dances of the East. This technique emphasizes isolations, musical interpretation, stretches, and alignment. Props such as finger cymbals and veils are often incorporated into classes. All levels welcome. Learn how to prevent injury and target pain and muscle-tension by building a strong core, increasing flexibility, and using props such as blocks, balls, and foam rollers to stretch and self-massage. The tools that you learn in these classes will improve your everyday life and add range and balance to your dancing. All levels welcome. Whether your goal is to enjoy an evening dancing with friends or to prepare for stage performance, our salsa classes deliver a solid foundation and will give you confidence to add your own flair to the dance floor. Tap evolved from African-American and Irish-American folk dances and is integral to contemporary American musical theater. Learn coordination and rhythm while enjoying a challenging and engaging workout. Yoga is known to build strength and increase coordination and flexibility. We offer multiple styles that are appropriate for students of every level. Instructors provide personal attention, ensuring that each student has a safe and enjoyable yoga practice, leaving relaxed and refreshed. Classes are available for students at every level of experience. Copyright � 2013 Alvin Ailey Dance Foundation, Inc. All rights reserved.